A painting by Holser Ludeña Pucllas portrays a remote Ayacucho village caught “between two fires” during Peru’s internal armed conflict. By Steven T. Zech. Research on internal armed conflict focuses on insurgent groups and state security forces. 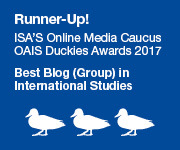 However, in recent years, scholars have started to investigate the important role that other non-state actors play during and after violent conflict. 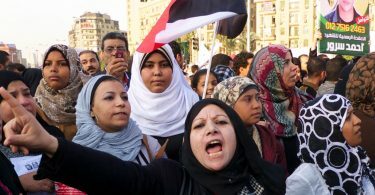 Civilian groups, labor unions, businesses, NGOs, and journalists are just a few examples of non-state actors that affect security outcomes tied to conflict. One particular category of actor that merits additional attention is that of artists. How can art affect the trajectory of armed conflict? What role does art play in “post-conflict” societies? How can art affect change in contemporary social conflicts? During recent fieldwork in Peru I had the opportunity to speak with painters, artisans, musicians, and theatre groups to investigate the intersection of art and politics. Art is a form of creative expression that requires interpretation and invites contemplation. Art might serve as a mobilizing force and facilitate violent action during conflict. States and militant groups alike use propaganda to articulate ideologies and communicate political objectives. Collective actors can use artistic expression to define and reinforce particular social identities. Art can facilitate violence when it helps foster nationalism or dehumanize an enemy. For example, in the case of Peru, the Shining Path painted graffiti and murals in public spaces to share political messages. Shining Path militants used theatre and folk songs in remote Andean villages to indoctrinate and mobilize community members in the early years of the conflict. Art can also serve as an important tool for peace and can foster nonviolence during and after armed conflict. Underground music movements in Lima criticized Sendero violence and denounced state human rights abuses. Painters organized exhibitions to champion peace and reconciliation. Armed conflict and increasingly authoritarian politics in Peru eventually gave way to memory and truth projects during the early 2000s. Art helped to articulate experiences in war and served as a tool of remembrance. The Peruvian Truth and Reconciliation Commission (CVR) encouraged the public to revisit the past and confront the horror and atrocity from the conflict period of 1980 to 2000. 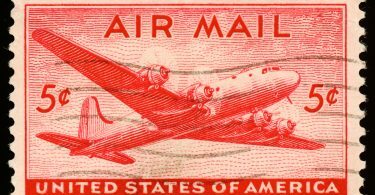 As part of this process the CVR collected thousands of testimonies as well as photographic materials. The Commission released a final report and established a permanent photography exhibition at the National Museum in Lima called Yuyanapaq (to remember). Artists, activists, and academics collaborated on other projects to invite reflection and to increase public awareness about the violent period. Installations like the “Eye that Cries” and the soon-to-open “Place of Memory” commemorate victims of violence. The Peruvian government, NGOs, and artists also encouraged communities to investigate and remember their own experiences through ethnographic drawings or traditional artistic media like tablas, retablos, or arpilleras. These works of “folk” art depict massacres and other attacks perpetrated by militants and the state security forces. Art helped to facilitate public engagement with the recent national trauma. The Vichama group in Villa el Salvador also worked with themes related to the conflict. At the height of violence near Lima, the Vichama theatre served as a positive force for change. During a conversation with director César Escuza Norero, he described the group’s work in the community alongside his close friend and nonviolent social activist Maria Elena Moyano. She was later murdered and blown up with dynamite in front of her children by Shining Path militants. Just days prior to Moyano’s death the director reluctantly promised Moyano that he would write a play about her efforts if anything happened to her. He recalled, “I told her I wouldn’t do it because she wasn’t going to die. She insisted and I made her the promise that I would do it. Days later they murdered her. We went through a very difficult period. The theatre was attacked two times. Many of my friends were arrested or wounded. It was hard, but we did the play. We followed through on the promise. I’ve never met a woman, a human being, so unafraid of death.” Today, Vichama continues to perform theatre that engages with pressing contemporary themes. The group’s most recent production raises awareness about the dangers of extractive industries, the exploitation of natural resources, and environmental degradation. 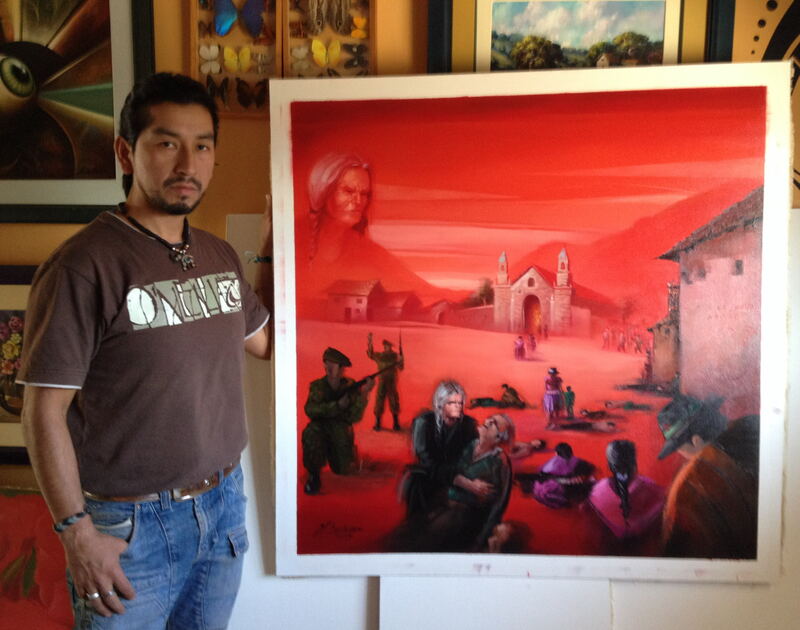 I met numerous painters who have spent their careers engaging with social and political themes in Peru. After working in unison with the CVR, many artists continue to give voice to victims and advance the cause of justice. For example, Mauricio Delgado creates paintings, mixed media, and virtual art projects. He works closely with the National Association of Families of the Kidnapped, Detained and Disappeared (ANFASEP) in Ayacucho. He has drawn dozens of portraits of women who demand justice for their disappeared husbands and children. Delgado explained, “In 1983 these women made demands before anyone started to denounce human rights. 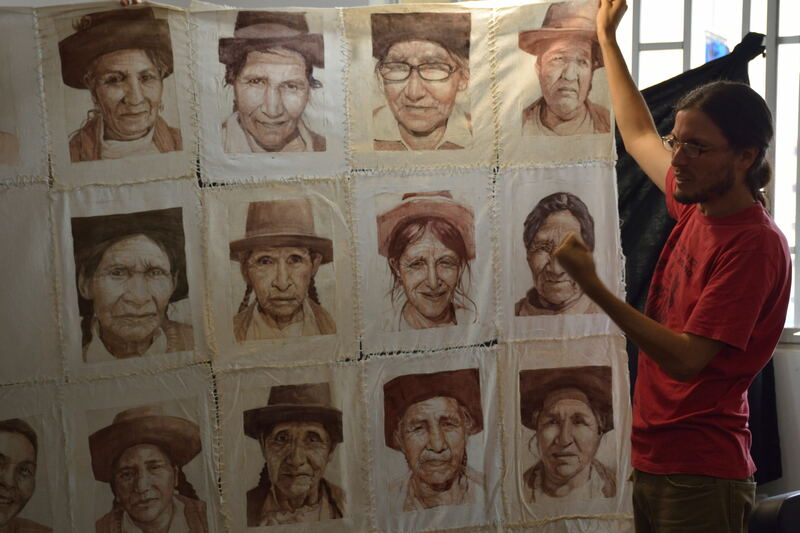 They made signs on flour sacks donated by local bakeries and wrote, ‘Alive you took them, alive we want them.’” He paints their portraits on the same type of sacks, sews them together, and displays the work at events in honor of their efforts. Mauricio Delgado shows a section of his work commemorating efforts by ANFASEP activists who denounced the disappearance of loved-ones during the internal armed conflict in Peru. By Steven T. Zech. 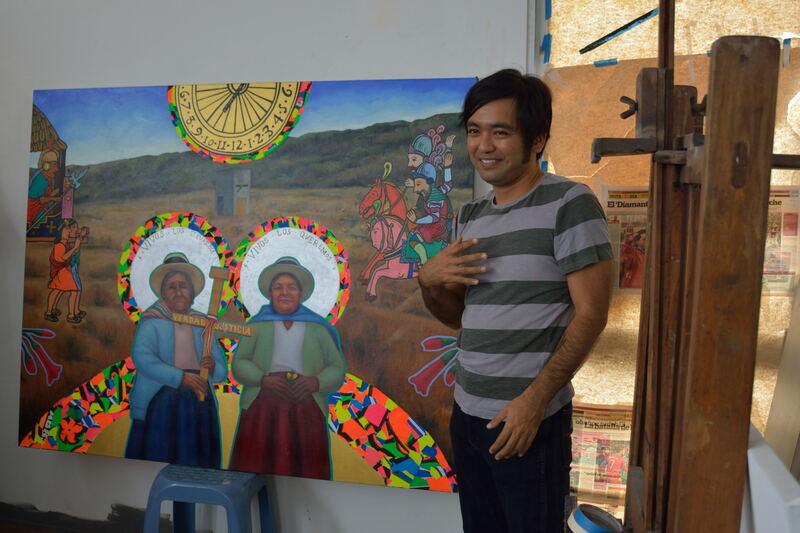 Jorge Miyagui shares his painting “Coloniality’ which depicts the colonial encounter between conquistadors and Inca Atahualpa, the furnace at Los Cabitos military base in Ayacucho, and two ANFASEP mothers: Angélica Mendoza and Lidia Flores. The text reads, “Alive you took them, alive we want them,” a popular slogan used by the mothers of the disappeared. By Steven T. Zech. 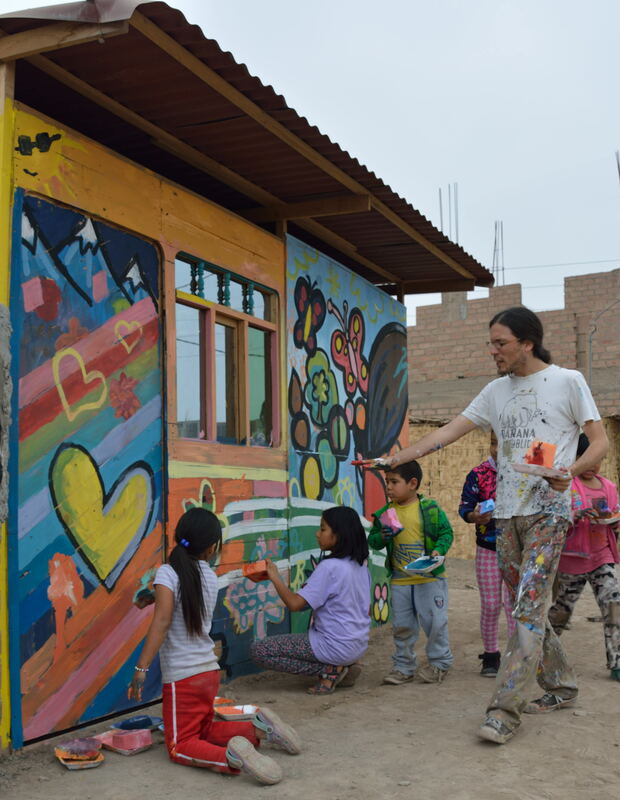 Mauricio Delgado and the Muralist Brigade work with children on a mural about literacy in San Lorenzo. By Steven T. Zech. Artists play a critical and understudied role in conflict. Artistic projects continue to influence demands for truth and justice in “post-conflict” Peru and will certainly affect any contemporary movement aimed at social change. Numerous contentious political events came to dominate the Peruvian national news in May and June of 2015. Massive social protests and incidents of state repression related to mining projects in Tia Maria and other locations captured public attention. Art projects like public murals became one important way in which communities articulated their positions and made new demands on the state and private enterprise. As Peru continues to deal with conflict tied to the negative effects of extractive industries, a growing illicit drug economy, and a widespread urban crime-wave in Lima, the artistic community remains at the forefront of public dialog and collective efforts to address these problems. For more detailed examples see chapters in the edited volume Milton, Cynthia E. 2014. Art from a Fractured Past Memory and Truth Telling in Post-Shining Path Peru. Durham: Duke University Press.